House Speaker Nancy Pelosi (D-Calif.) voiced her support on Thursday for lowering the federal voting age to 16, telling reporters during a press conference that doing so would be a boon to voter engagement in the U.S.
Pelosi said Thursday that lowering the voting age would drive interest in politics among younger Americans who are learning about the subject in high school. The Speaker said that changing the voting age to 16 would help drive a higher level of voter awareness and turnout. 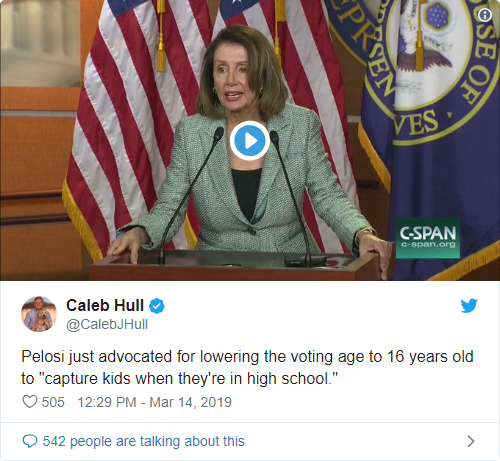 Pelosi's comments Thursday echoed those she has made previously, including in a 2015 New York Times interview in which the Speaker said she was "all for" lowering the voting age. The California congresswoman supported a local ballot initiative in her home district of San Francisco in 2016 that would have lowered the voting age in municipal elections to 16, known as Proposition F, but the measure was defeated by single digits at the ballot box. Yeah, and they could have the teachers unions show them how to vote. Oh I forgot, they already do. How convenient. Of course she does. She’s reaching for a one party system in the USA. The human brain doesn’t finish all its developmental stages until age 25. They want illegal immigrants and now children voting for powerful politicians and policies the rest of us will have to obey. They are not any longer hiding their desire for one party rule and machine politics at the national level. Universal sufrage is a societal death sentence, regardless of age. Outta on the face of it! And besides, these kid’s aren’t being taught about government. Looking for uniformed, but highly energized and malleable, voters where ever they can be found. The oddly, and ironically named "Democratic" party just HATES free, fair, and adult Citizen elections. Beyond mere socialism, might this is be Venezuela partie deux, headed our way? If they can vote they should be able to buy guns. This is a admission that the Democratic Party no longer appeals to responsible adults. I back making the age for consuming intoxicants, driving, military service, and voting accrue one year apart in precisely that sequence, starting at sixteen. We don’t know who runs the Democrat Party. It isn’t the followship we see on TV in the form of Schumer, and Pelosi. They are just the policy readers for the real leadership, the invisible leadership, the ones behind the curtain. Where’s Dorothy when you need her. Why not 8? And a $100.00 an hour minimum wage? And abortion up to the age of 3? And 4 votes per dem, 1/4 vote per conservative? Oh, and the death penalty only for white males! Heinlein had the best idea I ever came across. No true citizenship unless a person serves a minimum of two years in the military. At the end of which he or she becomes a citizen with the right to vote, to hold office etc. Please be patient, Ms. Pelosi. The waves of illegal immigrants will get you that one party system soon enough.